Nice Home mit 4 Schlafzimmer, 2 Bäder und Etagenbetten für die Kinder. Unser Haus verfügt über sehr viel für eine große Familie mit großzügigen Zimmern bieten. Mit schönen malerischen Blick auf die Berge auf dem Vorderdeck. Oder für jemand nur wollen, für eine Weile weg zu bekommen. Flathead-Tal ist ein großartiger Ort, um Urlaub für die Outdoor-Enthusiasten. Wir haben Glacier National Park 20 Minuten entfernt. Big Mountain Ski Resort auch 20 Minuten entfernt. Flathead River und der Big Sky Wasserrutsche ist nur 5 Minuten entfernt. Unser Haus verfügt über vier Schlafzimmer und zwei Bäder. Wir verfügen über Etagenbetten für die Kinder und Familienspiele. 3 der 4 Schlafzimmer haben große begehbare Kleiderschränke. Unser viertes Zimmer verfügt über ein ausziehbares Sofa, und ein Futon-Bett für zusätzlichen Schlafraum. Wir haben 4 Luft Matratze, 3 Queen und 1 Zweibettzimmer sowie mit elektrischer Luftpumpe. Es gibt eine Waschmaschine und Trockner. Es verfügt über eine voll ausgestattete Küche, Wohnzimmer und Esszimmer. Die Küche verfügt über eine Kaffeemaschine, Mikrowelle, Backofen, Toaster, Topftopf, einen Kühlschrank und eine Spülmaschine. Es ist mit Geschirr, Töpfen und Pfannen. Wir haben auch kleine Dinge wie Gewürze, Mehl, Lagerbehälter für das Essen. Draußen auf der Terrasse haben wir einen großen Grill. Und eine Feuerstelle mit Holz. We stayed 4 nights with our adult children while we explored Glacier National Park and various Flathead Valley locations/attractions. 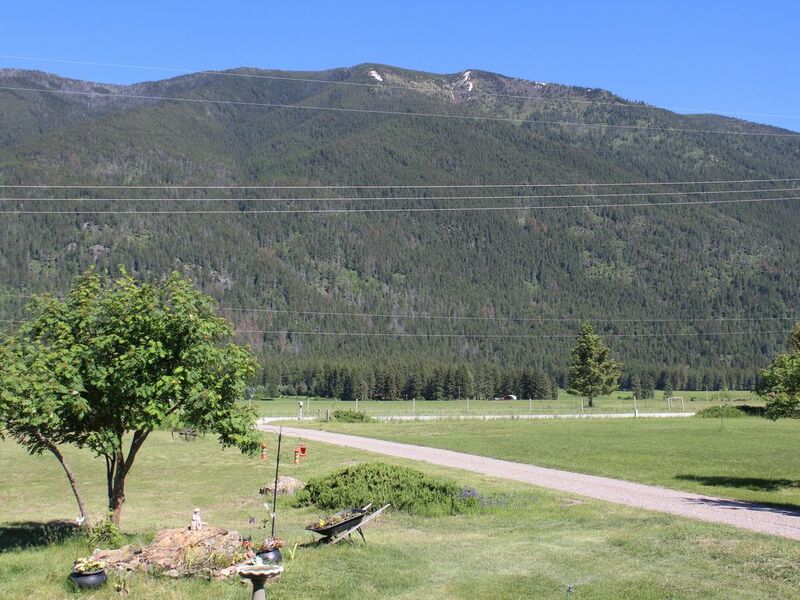 Very convenient to airport/rental cars, Columbia Falls/Kalispel/Whitefish area shopping and restaurants, and especially to West entrance to GNP and North Fork road. Hot tub was very nice at night to view the night sky! Interior could use a little more (brighter) light, but overall we had no complaints. We were a group of 8 staying in Columbia Falls while visiting Glacier National Park. Our group included 4 kids and 4 adults, including my family of 6 and my parents. I’m giving this property 5 stars not because it’s high end/luxury, but because it is clean, well-stocked, in a very good location, and is as pictured in the listing. We really enjoyed the space in the yard for the kids to play in and the private hot tub, which we made use of both nights of our visit. Shane was very responsive and accommodating, even when we decided to change plans and add a night for my parents to extend their stay last minute. Also, the house is very close to shops and some restaurants, including a fantastic breakfast/coffee shop just down the street. I would recommend this property and would stay here again! This four bedroom property sleeps 10 total easily from our 3 families. Kitchen was well stocked and equipped. The property manager answered our calls immediately and was very friendly. The house was decorated in a Montana style with cute accessories. We would highly recommend this property to other guests. This home worked very well for our family trip to Glacier National Park. It is only 15 minutes from the entrance. The house was very clean and well stocked. Loved that the kitchen had any basics that you might need. We also really enjoyed the porch and hot tub. We had a wonderful time here with our family!!! This is the prefect home with definitely a very awesome cabin feels once inside, very homey and extremely clean! Plenty of spaces for everyone (4 adults and 6 children) and we were always comfortable. The kitchen had everything you would needs from nonstick pots and pans to very nice plates and bowls. There were also tons of board games which was very fun for the kids. We love relaxing in the hot tub outside after our long long hikes at The Glaciers which is very close to the West Entrance. The gas grill was awesome to cook our suppers. Lots of little birds around and even a very friendly black cat with white paws and nose that visited us on the deck every night. The bathtub in the master bedroom didn't drain that well during the showers, but it was not a big deal for us. Met Shane on the first day, very nice guy! He even brought us extra bath towels the next day. We really appreciated the big veggie tray and the kids loves the bowl of candies the owners left as a welcoming gifts. Overall, both Shane and Debbie are great and very quick to reply to any inquires and this home is definitely a place worth your money! We would loves to stay here again in the future! Our family consisted of 5 adults and a 5 year old. We had plenty of room in the house. The kitchen supplies are amazing! There was everything we needed to prepare our meals for our two night stay. Our granddaughter loved all the toys in the closet to play with! She didn't want to leave. The home is very convenient to West Glacier. We arrived late and had no trouble finding the home with Shane's directions. If you are looking for a comfortable home -- well stocked and very clean -- while visiting West Glacier - this is the place! Thanks again for answering all our questions! Hope we can visit again some day. Günstig in der Mitte Glacier Country entfernt. Mit unbegrenzten Dinge zu tun und zu sehen für Outdoor-Enthusiasten. Mit Glacier National Park 20 Minuten entfernt. Big Mountain Ski Resort in 20 Minuten. Flathead Lake 40 Minuten entfernt. Flathead River 5 Minuten entfernt. Rates are subject to change until confirmed booking. The first payment for $250.00 is applied to the deposit you can call or email if you have any questions or want to make different payment arrangements. Due to some previous cancellations in the past. Know the $250.00 deposit to reserve this house is non refundable if you need to cancel your stay with us.